Regular Feminine Hygiene waste collection and disposal throughout the West Midlands by our Hygiene Service Division. Call for a free wash room survey and proposal. This Jumbo Toilet Roll Dispenser in white steel holds Maxi Jumbo Toilet Rolls. The Lifeguard 3 Way Toilet Cleaner is the ideal product for tough toilet cleaning jobs. It has a powerful acidic formulation that can kill all known toilet germs. This product is safe to use on most toilet surfaces including stainless steel and chrome plated. It is ideal for use commercial, business and domestic properties. This product is available to buy as a bulk buy option. This Shades air freshener is a quick and effective way to freshen up any area instantly. Maxi Jumbo Toilet Rolls 400 metres per roll, 6 rolls to a case, 2 ply paper. A standard white perforated roll but on a much bigger scale. 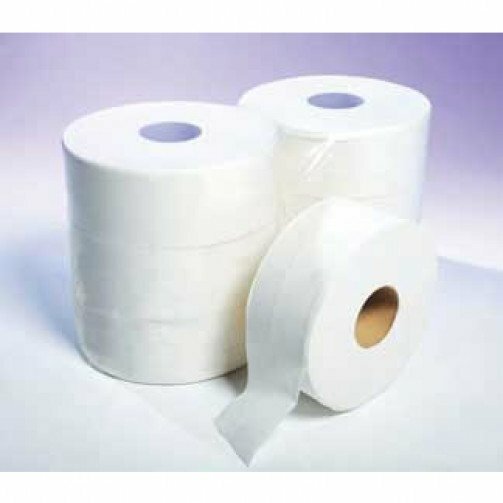 Jumbo toilet rolls are ideal for high usage washroom areas due to the much longer lifespan of the very large rolls. Maxi Jumbo Toilet Rolls are great for schools, colleges and restaurants.